7 Pack of MREs (Meal Ready To Eat) Meals - Each Includes a Self Heating System! Perfect For The Outdoors and Emergency Bags! - Only $3.49 each! Order 2+ for just 28.99! SHIPS FREE! Don't get left in the dark or trip over your tent gear. With this glow-in-the-dark camping set you won't be left in the dark! TENT STAKESThese 10.5" tent stakes are perfect for either replacement parts or as an upgrade to the plastic stakes that come with your tent. With galvanized steel for corrosion resistance and a diameter of 8mm to insures that the stakes do not bend. The colorful T top allows for easy visibility of the outer area of your tent which can often be tripped over at night when the glow of the fire does not reveal your tent lines. PARACORD Developed and manufactured by the U.S. Military for Paratroopers during WWII, adapted by civiliana & survivalists, and emergency preparedness preppers for use in an emergency and as a handy go to tool. The inner strands can be removed and both outer casing and the inter strands can be used. This will effect the overall strength though. There are endless uses for paracord, below are just a few. Importantly though. Paracord should be part of everyone's Camping, Emergency Kit, Go and Bug Out Bags. PARACORD - 550 PARACORD 7 STRAND COLOR: GLOW IN THE DARK GREEN Usable Cord Size: 100 ft x 5/32" Dia. - Bundled Dimension: 9" x 2-1/2" x 2"
CLEARANCE SPECIAL - 3 Pack of Refillable Torch Lighters - One 3-Pack for $5.99 or Two or more 3-Packs for for $3.99 each, just $1.33 per lighter! Limit 8 Per Customer - SHIPS FREE! 7 Deadly Deals is all about surviving retail prices day-to-day. 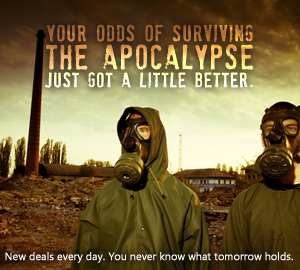 Check back every day for the next deal because you never know what tomorrow will bring!